Hi everyone! 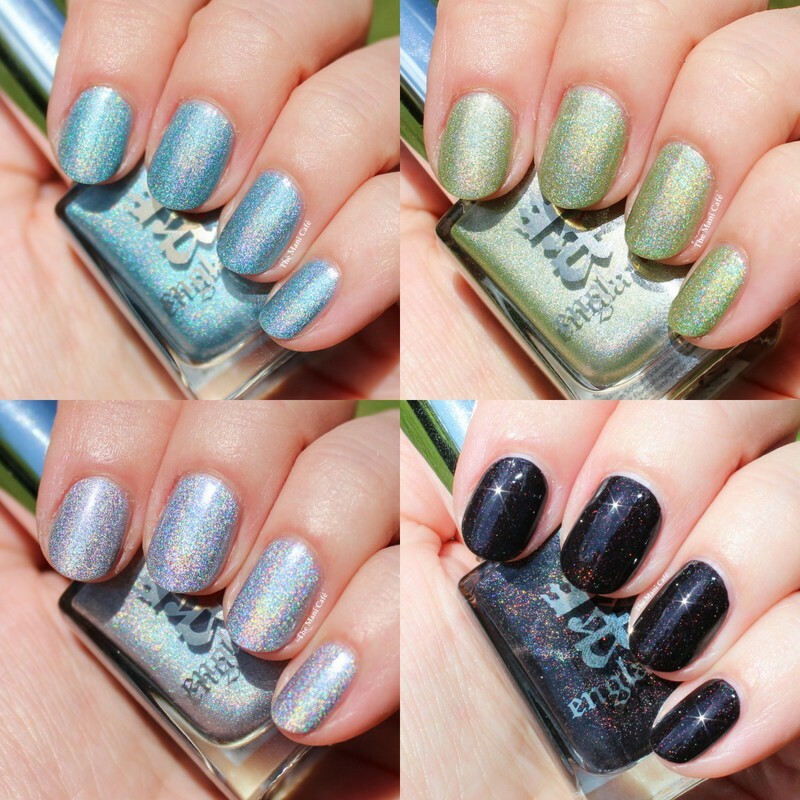 Today I FINALLY have my swatches of the A England Sargent's Vision collection to show you. I ordered the complete collection as always as soon as it was available and swatched them almost immediately. But life happened and I'm only just getting my post up now so I hope you can forgive me for being so late and that you appreciate the post all the same! This is one of my favourites of the collection for sure. At first I thought it was going to be quite similar to some other silver holographics and particularly A England Encore Margot from the Ballerina Collection. Yet I was quite wrong. Carnation Lily Lily Rose is unique in my collection and has a shimmer and multiple different colour flashes. It is hard to describe and I hope you can see what I mean from my photos! I used 2 coats, no topcoat. The formula was perfect. My other favourite from the collection. I absolutely love a good black nail polish, especially Adina's. She does them so well and each with something different. I didn't even realise before receiving this collection that Nocturne isn't just black. It is an extremely dark red-plum black and the multicoloured flashes in the holo peeking through are stunning. I used 2 coats and no topcoat. Formula and application were perfect. A lovely soft blue with the signature A England scattered holo. I wore this one as a full mani before reswatching and noticed that my topcoat (Revlon fast dry) dulled the holo somewhat. Next time, I will sandwich my topcoat between layers of colour. Either way, the effect is still beautiful. I used 2 coats but found that the first coat was a bit patchy and dragged over my topcoat. It reminded me of older formula holos which required the aqua base. I might try that with this one for easier application next time but everything evened out just fine with the second coat anyway. Photos here are without topcoat. A totally unique green in my collection. Very soft and perfect for spring and summer. Application was good also. I used 2 coats and no topcoat. Overall, this is another beautiful collection from A England. I don't expect much else from Adina to be honest. Remains for sure one of my favourite brands and I'm reminded why with each new release. I'd highly recommend Carnation Lily Lily Rose and Nocturne if you wanted to just pick up a couple of these. I hope you enjoyed the swatches! Hi everyone! Finally posting this mani I wore a good while back when I was wearing nothing but flakies! This is OPI Ski Teal We Drop, a vibrant teal creme topped with NfuOh 52. If you're a regular reader, you might know already that I'm in love with the NfuOh flakie polishes. I was so sad that they discontinued them, thankfully I had managed to find them all by then! I really love this combo and how the flakes pop against the darker base. Ski Teal We Drop is an amazing OPI must have I think. I love it alone as well and the formula is great. The best teal polish I own for sure. NfuOh - Various retailers (Mine were purchased from the Pshiiit Boutique, Atouts Charme and various beauty supply stores in the US) Though as mentioned, the flakies (if not others as well) are now discontinued.